Valentine’s Day…..a day for celebrating love and friendship! And what better way to celebrate friendship than by gathering together the gals that matter most to you and throwing a Galentine’s Day Party!? This year Gretchen and I decided to have our little heart-themed lunch at her house and include our friend Ally (who makes the cutest bracelets @embracedbyallyxoxo ) and her sister Sarah (you may recognize her as the model in most of our Bip & Bop website photos!) Champagne, heart shaped sandwiches and desserts, homemade decorations and the cutest party favors from Bip & Bop and @embracedbyallyxoxo all made this Galentine’s Lunch just “Love-ly”! We found the perfect table runner and “love you” plates at Target….that was our jumping off point for what color scheme we wanted to do. We decided to stick with a white table cloth and napkins so the red plates, tulips, and heart decor popped! For the place settings, Gretchen found red metal lace canisters in the Dollar Spot at Target. It was the perfect place for silverware with an @embracedbyallyxoxo bracelet around it. We wanted a cute heart garland, and searched around and when we couldn’t find one, we simply made one by stringing heart shaped dollies onto 1/4 inch thick satin ribbon. We found the doilies at the Dollar Store in red, white, and pink! And from the chandelier we wanted to hang something airy and sweet. So we cut out hearts (after tracing a cookie cutter) from scrapbooking paper we found at Joann’s fabric store and hot glued them to ivory ribbon. We wanted to serve something yummy, sweet and simple to go along with the pink bubbly we would be drinking! Gretchen made a chinese chicken salad, I made heart shaped tea sandwiches (cucumber/cream cheese and egg salad), Ally made fruit kabobs with heart shaped brownies, and for dessert we at brownies and strawberries topped with cool whip and a heart shaped strawberry. We wanted our guests to leave the party with the perfect heart themed parting gift. Each guest got a different Bip & Bop necklace. Gretchen stamped Tiny Initial necklaces with xoxo and cupid’s arrow, I made a few XO necklaces and rose gold Katie Heart necklaces. 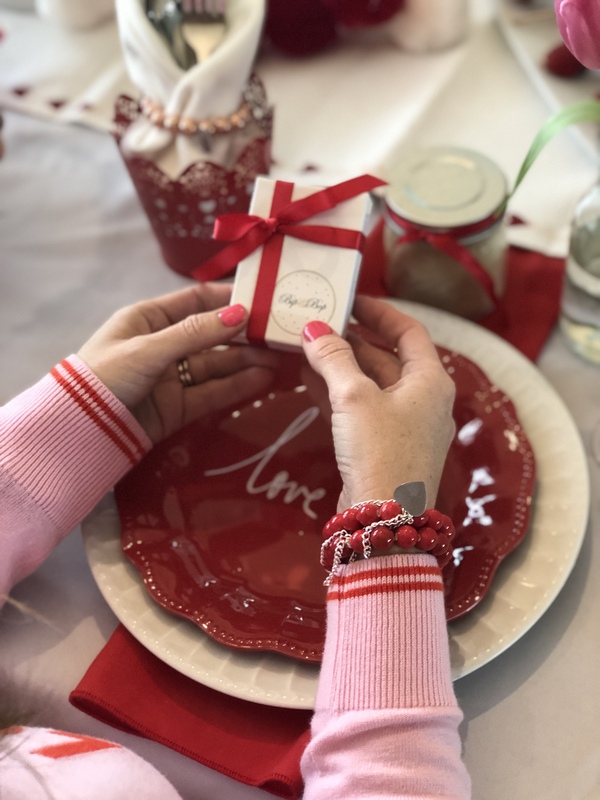 Ally made blush, red, and rose gold bracelets @embracedbyallyxoxo with cute silver heart tags on them that matched our valentine-themed outfits. Also, if you are looking for the perfect outfit for Valentines Day, I got my white sweater with red hearts from Wild Poppy and Co.. They have the cutest clothing there, perfect for everyday, holidays, and special occasions! No matter what Ally Gradley wears, she looks effortlessly chic and pulled together. In short, she’s kind of our style icon! We’ve rounded up our favorite looks from her blog, Gumboot Glam, where she has inspired us to wear our Bip and Bop jewelry in new and fabulous ways. Which is your favorite look?? It doesn’t get much better than seeing our jewelry on fitness + fashion blogger Erin Salvetti. Erin, from the blog Living Lately, is fierce, fun, and always dresses fantastically! We are so excited that she loves her Bip and Bop Jewelry as much as we do!! For outfit details, check out Erin’s blog post “All About the Dainty Details“. When it comes to styling Bip & Bop jewelry, we are taking notes from Alexa Haley! She’s the beauty behind The Bourbon Belle and she’s totally inspiring our spring wardrobe. Our Skinny Jessica Bracelet hand-stamped with her initials pairs perfectly with her flowy white dress. For outfit details, check out her Little White Dress blog post. Alexa tops off her adorable pink dress with our dainty Bow Necklace and Bow Bracelet. Perfect for Sunday brunch or a day out with your girlfriends! For outfit details, check out her Pink Lace Dress blog post. Love Alexa’s style as much as we do? Subscribe to The Bourbon Belle, and follow her on Instagram! Another Friday, another amazing lady rocking her Bip & Bop! We spotted Abby of Twist Me Pretty in our Gold Dipped Quartz Necklace, and couldn’t help but share her look. Pairing a neutral top and sleek pants with her Bip & Bop allows her necklace to make the ultimate statement. And speaking of statements…did you see those pink pumps?! Swoon! Head over to her blog for more photos and all the details on her outfit! Bip & Bop Mother’s Day Gift Guide! We are so excited to bring you an amazing giveaway, with over $300 in prizes! Every Rafflecopter “follow” or “like” is equal to one entry, and there are a total of 26 entries available per person! Following Bip & Bop on Instagram, Facebook, and Pinterest are a must! Good luck! We are so excited to bring you another Fashion Friday post. Our weekly series give us a chance to feature some of our favorite bloggers in their Bip and Bop jewels! This week, we have the gorgeous Sara from Haute & Humid. Sara is wearing our Tiny Bar necklace. How amazing does it look on her?! To see the rest of her outfit details and catch up on her blog, click here! Hi Friends! I just wanted to hop over and share our Lucky Bunny necklaces! Aren’t they the cutest?! We have a limited number available. They are just the cutest necklaces and will make the perfect addition to anyone’s Easter Baskets. Use the code: BUNNY upon checkout for free US shipping. Hi Friends and happy Friday! We are so excited to start a new tradition here on our blog! Each Friday, we will be sharing photos of our favorite bloggers styling their Bip and Bop pieces. This week, we are excited to have Melissa from Ella Brooks Blog. Is she not the cutest momma ever? We love how she layered her necklaces! Melissa is wearing the Asymmetrical Heart Necklace in the first photo, and layering the Geometric Necklace and the Jessica Necklace in the second photo. To see the rest of her outfit details and catch up on her blog, click here. Hi! We are Gretchen & Erin! We love to make handmade jewelry.... we are also friends, mom's, wives, neighbors, and co-owners of Bip & Bop. When we are not stamping and assembling jewelry, we enjoy hosting parties, decorating our homes, cooking, celebrating holidays, crafting, and more!